The 2014 Winter Olympics begins on February 7 and Kimberly (Schweitzer) Evering, ’94 (pictured at left), will be in Sochi, Russia, to cover the action. Evering, who works as web communications manager at Northern Virginia Community College and remains active with Buffalo State’s WBNY-FM alumni group, was selected after a yearlong interview process to serve as a flash reporter at the games. She will cover ice hockey and told NBCWashington.com reporter Jim Handly that she will be talking to the players and coaches and sharing information with the global media. In 2010, Evering volunteered at the Winter Paralympic Games at Whistler in Vancouver, Canada. That experience inspired her to apply for the Sochi Games. 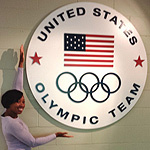 To keep up with Evering’s Olympic adventure, be sure to read her “Gal On the Go” blog and follow her on Twitter. Meanwhile, Jessica Walker, ’13, is working hard to make her Olympic dream come true in 2018. The former Buffalo State track and field star was invited to attend an on-ice bobsled and skeleton school last November in Lake Placid. The tryout—which she attended at the encouragement of Buffalo State strength and conditioning coach Nathan Young—paid off as Walker was selected by coach Don Hass to join the U.S. Olympic Development Team in skeleton, the hair-raising sport that sends competitors down an icy track face-first on a small sled. 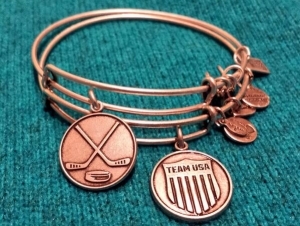 Help support Walker’s Olympic dreams.